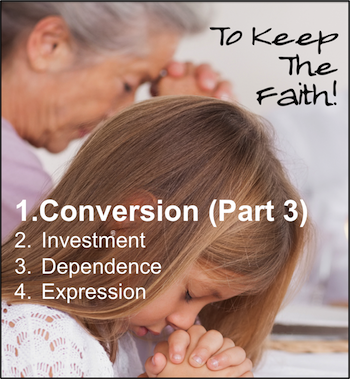 In this article we will focus on the third marker of true conversion. Appreciation for the healing process is essential to the survival of a young Christian's faith. Unfortunately, there seems to be two polarized views of this subject. Neither of them lead to good spiritual health. In order for our children to keep the faith, a balanced appreciation of healing must be taught. Celebration of the painful journey must be acknowledged, but a confidence in their salvation must also be emphasized. Consider the words of John. In other words, John, the best friend of Jesus, wrote the book of 1 John so that Christians can know, not guess, not wonder, not wring their hands in fearful guessing, but rather know with certainty they have eternal life. This confidence is essential to the growth, stability, and loyalty of new Christians. Below is a brief summary of John's opening words about this subject. Please take time to read, digest, and share these marvelous words with the young Christians you know. "But if we walk in the light, as he is in the light, we have fellowship with one another, and the blood of Jesus, his Son, purifies us from all sin. If we claim to be without sin, we deceive ourselves and the truth is not in us. If we confess our sins, he is faithful and just and will forgive us our sins and purify us from all unrighteousness. If we claim we have not sinned, we make him out to be a liar and his word is not in us." In the final, climactic verses of 1 John chapter 1, the Holy Spirit explains the formula for assurance - honesty, confession, and application. One could also view this section of Scripture as a three-question test to determine if we are walking in the light. Honesty - Verse 8 forces us to ask the question, “Am I being honest about my sinfulness?” Walking on the path of light does not involve a continuous check-off list of righteous acts, it involves a continuous honesty about our sin and the hopelessness of trying to save ourselves. Application - Verse 10 concludes the test by forcing us to ask, “Am I applying the Word of God so that it can have a place in my life?” It is not enough to conclude that we are sinners, or even to admit it, we must also take positive steps to improve upon it. To do this, application of “his word” is essential. Honesty and confession are important, but only when a Christian commits himself to making positive change in his life can a passing grade on the assurance test be awarded. We must make a place for His Word in our lives. In order for us to be certain of our salvation, we must be walking in the light. If during this journey we continue to be honest about our sin, confess that sin, and make a place in our life for the Word of God, we will remain in the light. As we continue making room in our life for the Word of God, exposure to the light will reveal more sin. When it does, we must be honest about the sin, confess the sin, and return to making a place in our life for the Word of God. Do you see the cycle being described in this passage? That cycle is called walking in the light. If we stay in the cycle, we stay in the light. If we stay in the light, we can be certain of our salvation. That is the true biblical view of the healing process. Much like the physical body requires ongoing attention to remain healthy, health maintenance for the spiritual man is also ongoing. (Note: The destructive doctrines of "Once saved always saved" must be avoided. They simply do not flow from the words of John.) If we will teach our children the Holy Spirit's balanced view of the blessed assurance, they are much more likely to settle into their spiritual place within the body. Their spirits will be unbroken and their freedom in Christ will lead to joyful initiative and loyalty to His church. In order to stop the mass exodus of young people from the church, the first and most foundational step of conversion must receive greater emphasis. Teach the young to count the cost. Help them find the Divine starting point. Hold their hand as they journey through the crisis of faith, surgery of Christ, and healing of the Holy Spirit. Teach them to embrace a complete conversion. Back to Top of "A Healing from the Holy Spirit"